Home Ringside How To Measure Reach In Boxing? How To Measure Reach In Boxing? Behind height and weight, reach is probably the most important fighting statistic in boxing as it can make a huge difference during a fight. If there is a big reach difference between opponents when game plans need to be changed and training methods need to be altered. Here we will go through why reach is so important, how to overcome it and ultimately how you how you are able to measure your own. Some people have longer arms than others, so two men who are the same height could have to very different reaches. Why Is Reach So Important? There is a common phrase in boxing called being ‘beaten to the punch’ when two boxers through a punch at the same time which leaves them both open with obviously the one connecting first and delivering the hurtful shot. In boxing, a fighter with a longer reach is much more likely to beat his opponent to the punch as it’s easier for them to do so. We saw this in a fight between Oleksandr Usyk and Murat Gassiev where Usyk was able to confidently move around the ring and snap out his jab and constantly keep Gassiev at range and dominate him. Usyk had a two-inch reach over Gassiev which is important as the Ukrainian can stay at a range where he can connect with his opponent but his opponent can’t connect with him. After the fight where Usyk dominated, many speculated about how he could move up from cruiserweight to the heavyweight division and cause problems to the best out there. 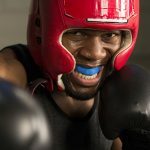 What people seem to forget here is that sometimes there are only to certain about of disadvantages that superior boxing skills can make up for. Usyk was able to dominate Gassiev partly due to his reach advantage, against someone like Anthony Joshua his disadvantage here would be about four inches which are very significant in boxing. Having a disadvantage like that means that you have to find a different way to win and a different way to train. A man like Usyk simply couldn’t fight against a tall heavyweight the way he could against an average cruiserweight, reach matters. One of the funniest ways that a boxer has tried to overcome a reach disadvantage is when David Haye v fought Wladimir Klitschko. Wladimir was famed for his ramrod jab which he used to win many fights. Haye was seen trying to dodge a boxing glove at the end of a large piece of wood so that he could get used to trying to get around a long jab. In the fight though, it didn’t work, Klitschko used that jab and won the fight easily. David Haye is actually one of the best examples of a fighter overcoming a reach disadvantage as he did vs Nikolay Valuev. In a somewhat ridiculous fight Haye was giving up over seven stone in weight and nine inches in height and also seven inches of reach. In most circumstances this might be seen as a dangerous fight for the shorter man but after the heavyweight limit, anything goes. This is an extreme example because of how good Valuev was, which wasn’t very. He won most of his fights due to his sheer size and Haye was by far the best fighter he was fought, given Evander Holyfield’s age when he controversially lost to the Russian. Valuev as very slow and ponderous but he was always a huge danger due to his weight, height and the reach that he had. The way that Haye got around that was to move constantly and wait for his opponent to throw that jab. When he did, Haye used his quick reflexes to not only get out of the way of the jab but to come inside and hit him with the counter attacks. Haye did this all night and Valuev had no answer. While most fights will never see a disadvantage such as this, it was an example of how to overcome someone who has a greater reach. When fighting someone who is taller than you there are three key zones to think about. The first is the safe zone where neither opponent can hit each other and this is where you’ll be most of the time. This will offer you time and space to avoid any attacks and to plan your own. The second zone is the danger zone and the one to worry about is the worst one as this is where your opponent can hit you but you can’t them back. This is where their reach advantage really counts and they can continually connect with that jab and not have to worry about getting hit back. It’s obvious to say but your in this zone should be minimal. The next zone is the firing zone where you’re going to do your damage and this is the zone where you both can hit each other. When fighting a man with a reach advantage, this is where you take that advantage away as you’re able to connect with your opponent. When entering or leaving the firing zone it’s important to do it as quickly as possible so that your time in the danger zone is kept to a minimum. One of the safest ways to cross that danger zone is to use their jab against them. When you do this timing is key and you have to act quickly. Coming in behind the jab is making your move straight after they have thrown their shot. After they have tried that jab and you’ve avoided it, they have to pull that jab back and this is where you can pounce forward and hit your counter attack. Another way is coming under the jab where you can slip under it and move forward to get straight into that firing zone. When David Haye fought Valuev, he knew it was too risky to start any attacks on his own like he would do against most opponents. He was just sitting back in that green zone waiting for Valuev to come forward. This was seen in the last round Valuev ever fought in the 12th round where he threw a lazy jab forward and Haye instantly reacted by lunging with a left. This allowed him to come inside and as Valuev was withdrawing back his left jab, Haye threw an overhand right with Valuev had to defend his the right hand which left his chin open. He using his reactions, quick speed and combinations Haye had got Value in a vulnerable position. With his chin exposed and Haye in range he delivered a left hook onto the chin of the man mountain. He didn’t get the knockout but it was the first time ever in his career that the 7 foot giant was rocked by as shot as he stumbled into the ropes. Most taller fighters though don’t look like Valuev, when matched in weight a taller fighter will be taller and slender with arms that are skinnier to the body than yours. This opens up more opportunities to throw shots to the body and get on the inside. While reach is a big advantage it also offers up opportunities as well. How Do You Make The Most Of Your Reach Advantage? Of course you may have times where you’re actually the taller fighter and you want to be able to use that to your advantage in the most efficient way possible. As we mentioned there having the greater reach can actually sometimes cause issues for a fighter and they have to be wary of these while trying to win the fight. One of the keys is to try and keep your opposition in that danger zone for as long as possible. If they move forward, you move back. If you move forward keep them at a distance and be wary of the counter-attack. You always want to make sure that you’re closing a little bit of distance if they’re trying to stay in the green zone. It seems obvious but the jab is your greatest weapon. You should never rely on it alone but it will be key for you winning the fight. If you can keep your opponents at arm’s length then they are going to have an extremely hard time trying to fit you. When they start to move on the inside then you have to be very careful. Imagine throwing a punch forward, there is a point where you are able to deliver your maximum power. This is further away from the body the taller you are, in respect of a taller fighter, this means that there is a point where you’re in their full power range but they are now too close for yours, this leaves you vulnerable and you should never fight at this distance. If you get on the inside then you shouldn’t panic but simply need to use your advantages again. If you’re not winning the exchanges then it’s much easier for a taller opponent with a greater reach to clinch and crush their opponents so that they can’t get their shots off. Having more reach is a big advantage as long as you use it correctly. So How Exactly Do You Measure Reach? When it comes to how to measure arm length it’s actually extremely easy but you might need a friend to help you do it. Obviously reach is a measure of how long your arms are but people might be alarmed to see figures such as 74” and think that some boxers have arms that are 7 feet long. The reason that arms aren’t measured by their length alone is that it would be hard to pinpoint an exact point to measure it from. Instead reach is measured a different way as it’s effectively your wingspan as it’s measured from the tip of your middle finger on one hand to the tip of the middle finger on the other. This gives a defined point of reference so that you can always be sure about the figure you are getting. To measure that wingspan though you need to have your back to the wall and then spread your arms straight out so that they are parallel to the ground, your arms must be completely horizontal to get an accurate reading. The next part is where you need a friend as someone needs to mark the end of your fingertips. Once you have done that then you can get your measuring tape out and take it from one end to the other. The figure that you come out with is your reach, which is most commonly given in inches. Reach is an important boxing statistic for a reason and that’s because it matters a lot when you’re having a fight. You are categorized by your weight but not by your height and reach, some fighters have longer arms than others at the same weight and it can be very difficult to fight against someone who has such an advantage. If you’re a shorter boxer though when you can adapt your tactics to make sure that you overcome it and if you’re a taller boxer then you should just rely on throwing out that jab, even though it will be your best weapon. So measure your reach and see how it stacks up to professional boxers who are the same height as you. Then you’ll be able to see how you compare and whether you’ll be having most of your fights with the reach advantage, or disadvantage. Here is a really useful video if you need a bit more help. Previous articleHow To Increase Punching Speed!? Our Top 6 Tips! Next articleLike Pink? Our Best Pink Punching Bag Picks!